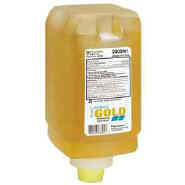 Mobile Catalog: Estesol® Gold Antimicrobial Hand Cleanser 6/Case. Estesol® Gold Antimicrobial Hand Cleanser 6/Case. A mild antimicrobial soap, it produces a rich lather. It also contains Triclosan, which has been clinically proven to kill a wide range of germs. 6/Case.